Table 5-1-3-1 shows the number of reported cases (including cases without any damage; hereinafter the same in this section) for robbery, theft, fraud, extortion, embezzlement, and embezzlement of lost property (including cases in which the victims were juridical persons or other organizations; hereinafter collectively referred to as “property offenses” in this section) and the amount of damage resulting from those offenses over the last 10 years. The number of reported cases and the amount of damage continued to decrease from 2003, although the amount slightly increased in 2011 from the previous year to approximately 170 billion yen (approximately 76.4 billion yen of which were in cash). By type of offense, the amount of damages resulting from theft accounted for the majority at 65.1% of the total damages resulting from property offenses, followed by fraud at 27.5%, and then embezzlement at 5.6%. From 2004 the largest amount of damages in cash resulted from fraud, accounting for 56.7% of total damages in cash resulting from property offenses in 2011. 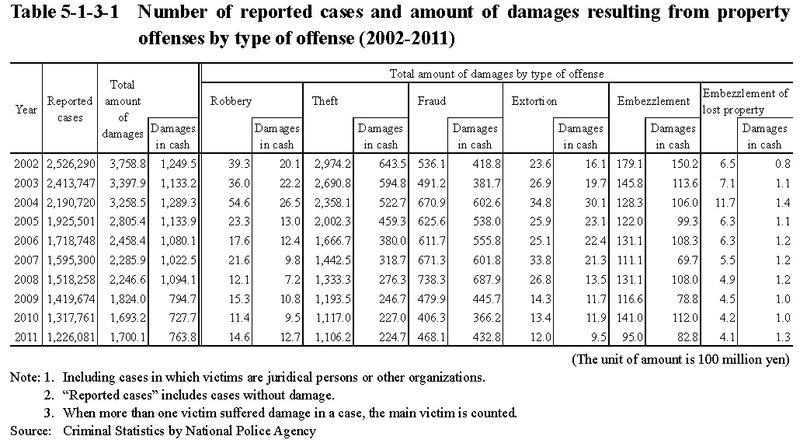 The amount of damages in cash resulting from theft in 2011 by modus operandi showed that approximately 12.9 billion yen were from burglary theft, approximately 9.44 billion yen from non-burglary theft, and approximately 0.12 billion yen from vehicle theft (Source: Criminal Statistics by National Police Agency).